Greenwich Academy won the Division I title at the 2019 HEAD U.S. High School Team Squash Championships at Trinity College on Sunday. The championship team included: front row, left to right, Brecon Welch, Emma Carney, Binney Huffman and Lindsay Westerfield. Back row, left to right, Claire Aube, Lucy Stephenson, India Stephenson, Haley Aube and coach Luke Butterworth. HARTFORD — The silver, cup-shaped winner’s trophy was displayed for all to see during Sunday’s U.S. Team Squash Championships and those who looked at the trophy saw one school etched on it numerous times. Following another brilliant performance at the nation’s premier high school tournament, the words Greenwich Academy will be soon be carved on the championship trophy yet again. At a historic venue that’s housed a lot of title-winning college squads, Greenwich Academy played like a champion, capturing the Division I title of the U.S. High School Team Squash Championships at Trinity College’s George A. Kellner Squash Center. Top-seeded Greenwich Academy added to its legacy by registering a 5-2 win over second-seeded Agnes Irwin School in the title match of the team squash championships. The victory gave the Gators an unprecedented 12 national squash titles since the tournament commenced in 2005, including four consecutive championships. There’s no secret to GA’s success. Besides possessing talent, the team works at its craft daily. Sunday’s triumph marked the fourth straight U.S. team title for Greenwich Academy’s two sets of twins — Lucy and India Stephenson and Claire and Haley Aube. 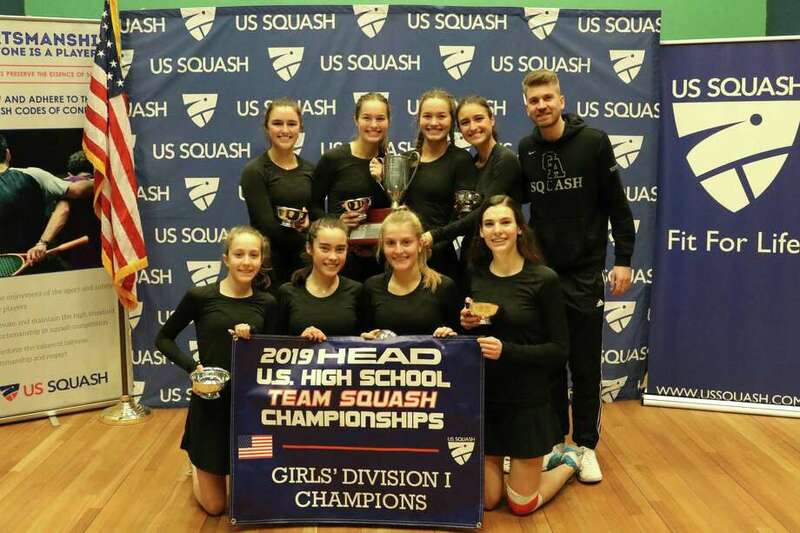 The quartet also won two national middle school squash championships at GA.
Greenwich Academy, which also beat Agnes Irwin from Rosemont, Pa., for the U.S. title last year, saw sophomore Lindsay Westerfield clinch the championship match from the No. 6 spot. Westerfield’s 3-0 win (13-11, 11-4, 11-2) against Catherine Costin gave GA its fourth victory of the match, sealing the squad’s fourth straight title. Westerfield didn’t seem nervous though, as she swept her way to victory. On the squash center’s two main courts playing first for GA in the title match against Agnes Irwin were Claire Aube (No. 2) and Haley Aube (No. 7). After losing the first two games against Margaux Comai, 11-8, 11-8, Haley Aube came back to take the next three games, 11-4, 11-9, 11-6. The sisters always inspire each other. At the second spot, Agnes Irwin’s Olivia Walsh edged Claire Aube, 11-5, 10-12, 11-5, 8-11, 11-4. In a match involving GA junior Emma Carney and Katharine Glaser at the No. 1 spot, Glaser posted a tight 3-0 win (13-11, 12-10, 11-7). Senior Lucy Stephenson was a 3-0 winner against Agnes Irwin’s Rachel Mashek at No. 3 (17-15, 11-7, 11-6). Junior Binney Huffman of GA took a 3-1 decision against Isabella Schneider at the fourth spot (11-3, 9-11, 11-7, 11-6). The fifth spot saw India Stephenson of GA defeat Caroline Glaser, 7-11, 12-10, 11-7, 11-7. The GA squad went 4-0 during the three-day tournament. Greenwich Academy’s B team also competed in the tournament, placing a solid sixth in Division I.
GA’s B squad included: Charlotte Gillis, Ali Murdock, Mary Duffy, Andrea Jemiolo, Megan Meyerson, Bella Trauber, Charlotte Forshner and Penny Oh.